Today I would like share with you a cute home décor for Halloween. You could win this new collection from Doodlebug, scroll down to learn more. 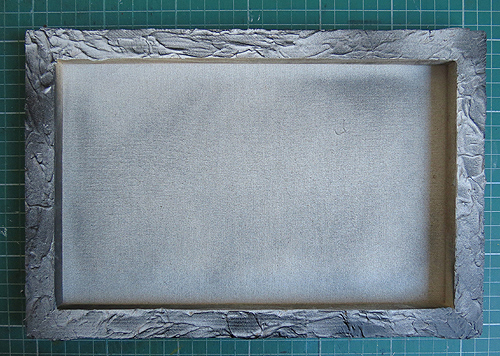 Step 2 – First I texturized the frame of the 8"x12" reverse canvas, using modeling paste and a painting knife. Step 3 - After the gesso dries, I apply the black spray paint. 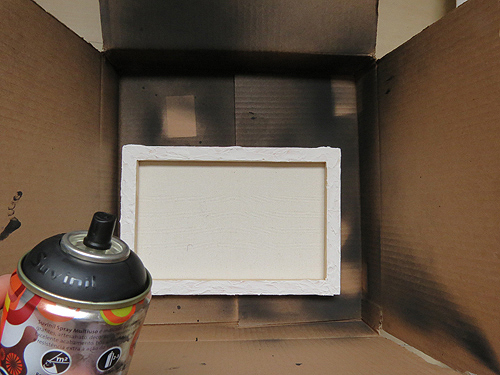 I recommend that you do this in a box to avoid the mess that's around, preferably outdoors because of the smell of paint can is very strong. 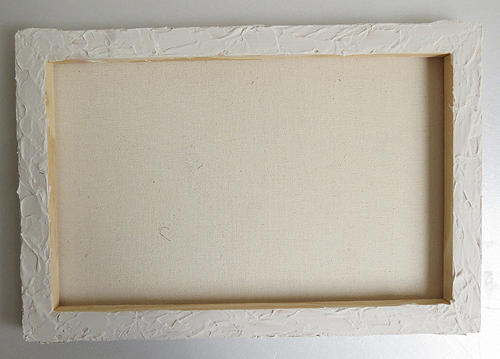 Step 4 - I don't fully painted it, I left half shaded. 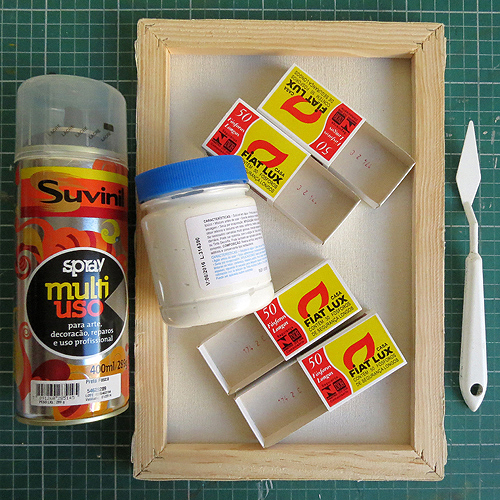 Step 5 - And I also painted matchboxes that were so. 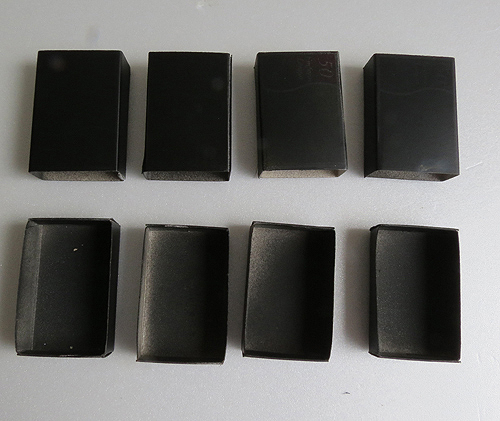 Step 6 - And then I decorated the small boxes, leaving them open, and I decorated the inside too. It wouldn't be a party if we didn't give away some of this new Haunted Manor Collection to a lucky winner. 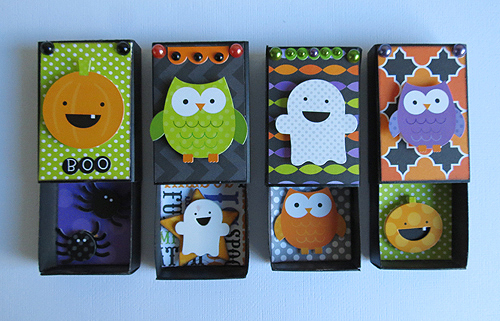 We'd love it if you'd tell your friends to come check out the Doodlebug blog this week to see some boo-tiful ideas!! Leave a comment telling us how you shared this (Facebook, twitter, email, text). Winners will be announced on Monday, August 27th. Ro this is pure genious... just love it! oh my golly - what a cool idea! i love this!!!! What a fantastic project!! Adorable!! Absolutely in LOVE with the new collection and was proud to share on Pinterest this morning. I shared on pinterest! This is such a cute project! I shared on Pinterest. LOVE the new Halloween line!!!!! I shared on Facebook, such a cute line and a very neat idea!! Love this! I shared on Facebook. I will share on Facebook, and Twitter! :-) Thanks for the chance to win!! I shared this on Facebook. Very cute project!! I emailed this to all my scrappin' friends. I'd love to win the collection. How cute!! I love Halloween, but don't have many pictures of it, so this is a perfect project! I will be sharing it on Facebook. Thank you for the give away!! Oh my gosh!! I love it, had to book mark it so I can try it. This is adorable!! I love the halloween!! I shared on FB and I told some of my friends that love to papercraft!! Thanks for a chance to win this awesome line!! To cute. I love it. I shared on facebook. thanks for a chance to win, hope you get lots of look sees. I shared on Facebook and Pinterest! Really cute project!!! Congrats Ro!!! I shared this on facebok and pinterest. My grandchildren would love it. Thanks!! Very cute! I shared on Pinterest. love the ideas ! shared on facebook ! AWK!! This is so cute!!!! 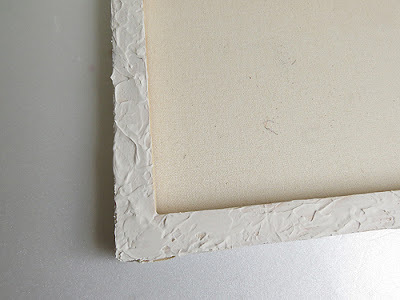 Darling papers and design! I texted this link to all of my scrappin friends...it is so adorable for Halloween! This is by far the cutest thing I have ever seen! I bought a ton of doodle pops about a month ago (the original ones) and love them so much! We may be moving in a month but making this with my daughter in our new home just in time for Halloween would make the transition a bit smoother! I shared on Pinterest, Facebook, text & email!! I love Halloween! I shared this great project by pinning it. This is just too adorable - LOVE it! I love it, but what did you do with the matches? This is so cute. Will share on my facebook! Great project! I shared it with my crafty friends on Facebook! Adorable and the papers are fantastic. What a great idea for your Halloween Decor. Love that you recycled the match boxes. Gotta pin this one and I'll share on FB. Thanks for the chance to win. I shared this with my crafty (and not so crafty) pals!! Love it. Adorei essa idéia para Halloween! As folhas estão realmente lindas e coloridas!Quero ganhar este KIT!!! This is so cute! Shared it in a text to my scrapbook friends! Awesome idea for home decor!! I have shared on fb and pinterest. This is so cute! I can't wait to make it. I shared it on facebook. Shared on Facebook. Thanks for a great give away! What a cute collection and fabulous project! I shared this link on my FB to let everyone know what great Halloween DIY projects are going on. 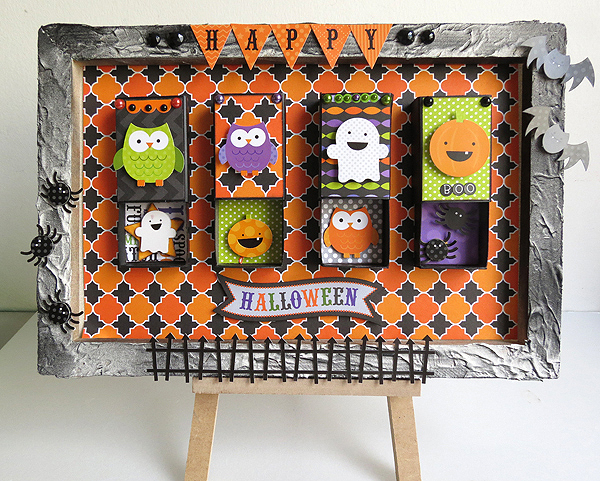 I love this cute not so scary Halloween project and the accompanying tutorial. I shared thru texting and emailing. OMG, Ro this is awesome!!!! Such a cute idea Am going to try to make one for our house. I shared this post on my Facebook page. What an adorable project! Love it! Shared here on FB. Thank you for the chance to win a prize. Love this - what a great dimensional idea. I will rave about it on facebook! Thanks for all the awesomeness that is Doodlebug! Great idea. I shared on facebook. pinned it and facebooked it. love the idea. I love Doodlebug and halloween is my favorite. Shared this with my scrapbooking friends by email & text and will definitely have to find it on Pinterest later and pin it too! Thanks for the chance to win. Halloween is my fav holiday and this collection is perfect! Will def share on Facebook! Thank you! Shared on my FB wall for all my scrappy gals to see! Too adorable (as usual)! Pinned it! :) Love the project! Now I need to find a frame! Phyllis Johnson said what a clever idea. How cute. I would love to win this so I can do this.Thanks for the opportunity. Very cute! Fortunately I have a Sizzix die to make my own matchbooks so this should be eazy-peazy for me - winning the collection would really help, too! I shared this on Pinterest! Love this idea! I shared on Pinterest and with my scrappin buddies... I love this paper set with so many cute accessories! I can't wait to have it! Thanks for the opportunity to win it! This is really cute & seems like an easy project for my girls Weekend Scrap-a-thon! Very cute! I'll be sharing on my Scrapnewe page on FB. I'll be putting a note on my FB page, sharing this darling design. I'd love to win it. I like to decorate for Halloween and this would work in well with my plans.